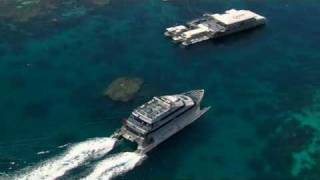 Experience the Great Barrier Reef with Quicksilver, Australia's most awarded reef cruise company. Choose from Quicksilver’s multi-award winning Outer Reef Cruise to the renowned Agincourt Reef where you’ll find the widest range of reef activities suitable for families and all ages, swimmers and non-swimmers included. Or if you prefer, set sail to the idyllic coral island, Low Isles, aboard the beautiful 30 metre sailing cat, Wavedancer, for a relaxed and all inclusive day. If you’re seeking the thrill of aquatic adventures, premier dive and snorkel catamarans Silversonic and Poseidon, with special roaming permits, will take you to experience three spectacular and different reef sites at the Agincourt ribbon reefs in one exciting day. 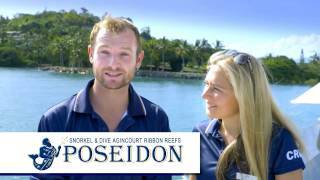 Designed for personalised dive and snorkel adventures, Poseidon is a modern 24 metre dive and snorkel catamaran that takes you on a journey of discovery into the stunning Agincourt ribbon reefs - one of the most pristine reef systems of the entire Great Barrier Reef. Perfect for experienced divers and snorkellers, Poseidon departs daily from Port Douglas to visit three different and unique reef site environments in this marine wilderness. With an extensive variety of over 30 exclusive reef locations, sites are selected daily according to weather and tidal conditions. Poseidon also has a special permit allowing guests to swim with the Dwarf Minke Whales and is accredited with Advanced Ecotourism Certification. Departing daily from Port Douglas, the ultramodern 29 metre Silversonic is custom-designed for the thrill of snorkeling and diving adventures on the outer reef. With over five hours to explore the delights of this underwater world, snorkellers can experience three different outer reef locations at the renowned Agincourt Reef, while divers can experience introductory diving and up to three certified dives (diving additional cost). A free snorkel tour, hot and cold buffet lunch, morning and afternoon teas are included in your day. With a state-of-the-art ride control system for a smooth journey, hot freshwater shower, change rooms, air-conditioned lounges and a licensed bar, you will be travelling in comfort and style. Coach transfers available from Cairns and Northern Beaches at additional cost. Tariffs quoted are for snorkeling only. For the experience of a lifetime, Quicksilver's high speed wavepiercing catamaran takes guests in air-conditioned comfort to the renowned Agincourt Reef, a jewel-like ribbon reef. With the most spacious activity platform on the Great Barrier Reef and a high crew ratio, guests of all ages, swimmers and non-swimmers alike, can experience this stunning reef world in comfort. Friendly and attentive crew, including marine biologists, are on hand to ensure guests enjoy and gain the most from their day. Explore the reef in a semi-submersible, underwater observatory, or by snorkelling and diving in the beautiful coral gardens. Your day also includes a delicious tropical buffet lunch, morning and afternoon teas. Exciting optional activities include introductory and certified scuba diving, guided snorkelling tours, Oceanwalker helmet diving and scenic helicopter flights. 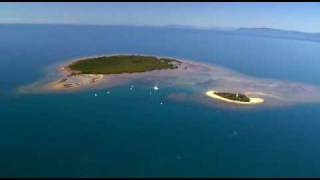 Low Isles is an idyllic, unspoilt Great Barrier Reef coral island. Combined with the romance of sailing aboard Quicksilver's beautiful 30 metre sailing catamaran, Wavedancer, this is the perfect day for families and couples seeking island relaxation. Wavedancer moors in the calm, translucent waters of Low Isles picturesque lagoon, where a host of reef activities await. Quicksilver's friendly crew take visitors on a leisurely, informative day where numbers are limited to preserve the environment. 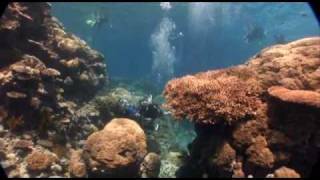 Discover the reef while snorkelling or glass bottom boat viewing. Take a guided beach walk and snorkel tour with a marine biologist or just relax under a beach umbrella, or on the decks of Wavedancer. A delicious tropical buffet lunch, morning and afternoon teas are included in your day.